We spent much of 2017 defending the Affordable Care Act, Medicaid, CHIP, and Medicare as Congress made attempt after attempt to roll back coverage gains. We remain committed to protecting these programs in 2018, and we are watching closely for any further attempts to undermine them. We know, however, that as we’ve collectively focused on defending these programs, healthcare costs for folks across PA have continued to rise, and many struggle to get the care they need. So, we’re releasing our state-level policy agenda for 2018. We hope you’ll join us in proactively pushing for a better healthcare system for all Pennsylvanians. Increased transparency in prescription drug pricing, a move we hope will ultimately lead to lower prices. An end to practices – like surprise medical billing – that unfairly put the burden of healthcare costs on patients. Pursue state-based reforms that would stabilize the insurance market, like a state-based individual mandate, state-based reinsurance program, or stronger oversight in the rate setting process. Working to make sure that Medicaid plans include enough doctors and other providers within each PA county. Pushing for increased access to oral health coverage through Medicaid and reduced red tape to access it. Pursuing state-level regulations to limit the use of short-term (and unregulated) health plans the Trump Administration is pushing for in yet another attempt at ACA sabotage. Health isn’t just about seeing a doctor, and if you don’t have a safe place to live, you can’t stay healthy. PHAN is working to ensure that high-risk folks have safe housing, a cost-effective intervention that keeps people out of the hospital. Seniors & people with disabilities need to be able to access a range of services in their homes to stay healthy and live well in their communities. A new state program launched this year aims to do just that, but PHAN is working to make sure its implementation goes smoothly and that plan members are getting the services they need. Launching our #MedicaidWorksforPA campaign, aimed at dispelling stereotypes about Medicaid and telling real-life success stories about how well the program works for Pennsylvanians. 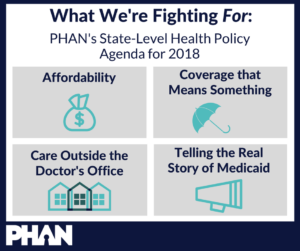 PHAN is working directly with state agencies to make Medicaid even more efficient than it already is, through creative solutions that create incentives for hospitals and doctors to provide better, evidence-based care at a lower cost.